Unreleased trauma is typically at the root of disruptions in human health and peace of mind, denying us the capacity to live a joyful and creative life. The rise of trauma energy and its accompanying emotions can become locked within our brain and retained throughout our body's musculature, nervous system and organs ...hoping for release. Instead, we clench and retain the stress, manifesting it in aches and pains, sleep disorders, cardiac problems, poor digestion, weak respiration and immune system weakness. 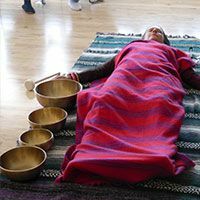 "The longer I do bodywork, Reiki and most recently, begin to apply the techniques of sound-healing, I have come to realize that a huge thread is common to all of these restorative modalities," explains wellness therapist Gina Armstrong. "In order for real healing to occur, the recipient must learn how to enter into a safe, secure, virtual space, one that permits them to soften their body, to release and relax the ever-present grip of their mind." As a physician with more than twenty years of medical practice from which to observe, author Dr. Judith Orloff sees surrendering as the missing part of the healing equation. “I’m intrigued with the idea of surrender, not as defeat or loss—as it is frequently thought of—but as a positive, intuitive way of living,” says Orloff. Contrary to common stereotypes that equate surrender with weakness, in her latest book “The Ecstasy of Surrender,” she presents surrendering as a way to gain mastery of your life. “People don’t think surrender will work because they fear giving up power,” she explains. Our brains are not only divided into hemispheres, but we also have three distinct interconnected and interlinked layers or sections that regulate behavior. All three have specific functions that relate and interact with each other. At the core, is the earliest “Reptilian” brain which is responsible for what evolutionary biologists describe as a typical mammal’s four basic drives, the four Fs: Feeding, Fighting, Fleeing and Fornicating - the autonomic behaviors necessary for survival of the species. Comprised of the upper brain stem including the hypothalamus, basal ganglia and part of the olfactory system, it’s also responsible for involuntary responses such as your heartbeat and breathing. The Limbic system of the brain, the middle section that first emerged in Mammals, is in charge of emotion and motivation as well as learning and memory. The outer layer called the “Neo-Mammalian” brain consists of the Neo-cortex and the connected thalamus. It is responsible for complex stimulus analysis, abstract and rational thought, language, introspection, creation, manifestation, imagination, awareness, development, empathy and most importantly, consciousness. Trauma may result from any manner of unexpected occurrences: accidents, invasive medical procedures, sexual or physical assault, emotional abuse, neglect, war, natural disasters, loss, birth trauma, or the corrosive stressors of ongoing fear and conflict. Dr. Peter A. Levine has developed a therapeutic system he calls Somatic Experiencing, which explains that trauma is not caused by the event itself, but rather develops through the failure of the body, psyche, and nervous system to process and release these adverse experiences. Our brain simply gets "stuck" in the fight, flight, freeze, or collapse responses. Although humans are similarly designed to rebound from high-intensity survival states, we also have the problematic ability to neo-cortically override the natural discharge of excess survival energy. Through rationalizations, judgments, shame, enculturation and fear of our bodily sensations, the human nervous system may not reset like that of a tiger after an overwhelming trauma.